Ibrahim Khalil Jewel: DataS Romania is a very famous Software company in Europe headquartered in Romania—has come to Bangladesh with its world-class, suitable Software for Garment Industry named “TimeSSD” and “GPD” (General Production Data). These two Software will be very useful for Bangladesh’s apparel sector as these are being used as “Scientific Work Measurement Tool with International Standard Time Database”, which will increase efficiency and cut costs. TimeSSD can accurately calculate the skill level of the workers and the production target. It is also able to identify where the limitation to achieve the target is. As a result, production could be increased more using the same time, same labour and same cost. On the other hand, the GPD software is real-time tracking. It can do merchandizing, inventory management, industrial planning, production monitoring etc., which makes working of a factory much easier and efficiently. On the occasion of formally inaugurate of these two software in Bangladesh market, DataS Romania and its Bangladesh Exclusive Distribution Partner ‘Hosanna Resources, Bangladesh’ arranged many programmes including technical seminars titled “Focus on the Essence” on 16 March, 2018, Friday at Surma Hall of Marino Royal Hotel at Uttara Model Town in Dhaka. Over 200 participants including representatives of RMG sector, technology experts, technical professionals, apparel businessmen and representatives of various media, participated in the seminar. The seminar highlighted time and cost saving methods by increasing efficiency in RMG sector, which covered the topics: -Labor content benchmarking with Industry 4.0 ready, collaborative, scientific work measurement software tools - Objective price negotiations with swiftness - Pay less for your relevant data to get the valuable info. Mr. Laszlo Szabo, Managing Director of DataS Romania, presented live demonstrations with timeSSD; Mr. Joel Boidya, CEO of Hosanna Resources, Bangladesh focused on the essence in the RMG sector & GPD software solutions and Mr. Szilard Varga, Senior Consultant of DataS Romania also spoke in the programme. For the details query interested clients have been requested to contact with Mr. Joel Boidya, CEO of Hosanna Resources, Bangladesh @ 01712-806 794. 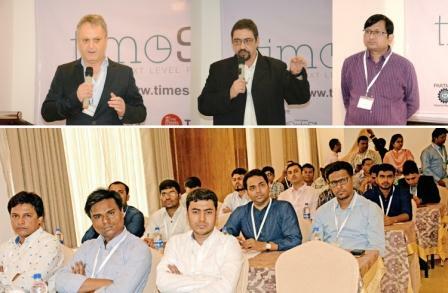 The Apparel News—Bangladesh’s first Bi-Lingual news media on Textile & RMG— was the Media Partner of the event.